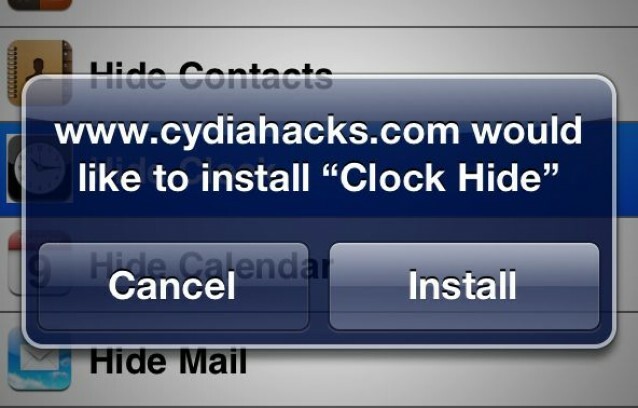 First, open up mobile Safari, and visit www.cydiahacks.com. Here you’ll be presented with a list of stock iOS apps, and everything’s here, including Reminders, Contacts, Notes, Calculator, Clock, and even Phone. Of course, the installation will fail and you’ll get an “Unable to Download Application” error, because the app hasn’t been authorized by Apple. However, when this happens, it will leave the app you’ve chosen to hide with an incomplete icon. You can now tap and hold on that icon until it jiggles, when tap to delete it like any third-party iOS app. I think you’ll agree this is a pretty handy tweak. Not only is it a great way to clean up your home screen and remove unwanted apps, it’s also the perfect prank to play on a good-humored loved one.